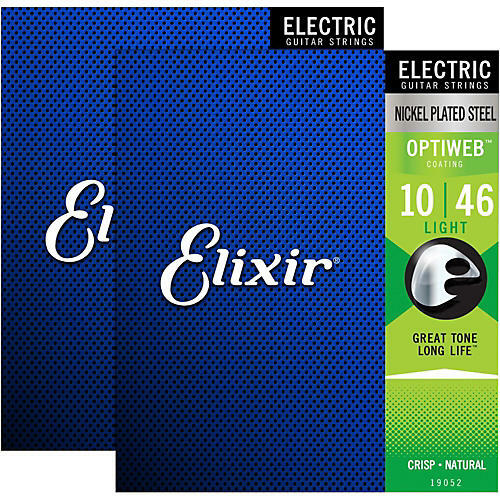 Thanks to Elixir's OPTIWEB Coating, these nickel-plated steel electric guitar strings give you the performance of natural string – that crisp tone, natural feel and playable grip you know and love – without sacrificing the signature, long-lasting tone life of Elixir Strings. Compared to their POLYWEB Coating and NANOWEB Coating, the OPTIWEB Coating offers the most natural and familiar feel Elixir strings offers. This lightweight coating allows the string to vibrate with less damping, while also having a firm grip, putting you in control of bends, vibrato and sustain. So choose the same premium electric guitar strings that experienced players worldwide trust to keep their incredible tone longer than any other string available. Unlike other string brands, Elixir Strings coat the whole string. This protects not only the outer string surface but also the gaps between the windings where common tone-deadening gunk typically builds up in other brands' coated and uncoated guitar strings. Anti-Rust Plating on plain steel strings ensures longer tone life for the entire set. For a slicker, gentler feel, try a set of electric guitar strings with Elixir's POLYWEB Coating, which also features their warmest tone. Meanwhile, their NANOWEB coated strings sound bright and feel smooth, striking a dynamic balance between POLYWEB Coating and OPTIWEB Coating.